When it is the Summer in Virginia a Cobia charter is one of the most exciting fishing trips you can do. Cobia fishing begins late May and can be caught through late September. Virginia is possibly the best location on the East Coast to target Cobia. Cobia migrate up the East Coast to spawn in the Chesapeake Bay. Finao Sportfishing is located along the Chesapeake Bay at Vinings Landing Marina. This allows our Cobia charter to begin quickly since we are close to the best fishing grounds Virginia has to offer. Click Here to book your Cobia charter today! 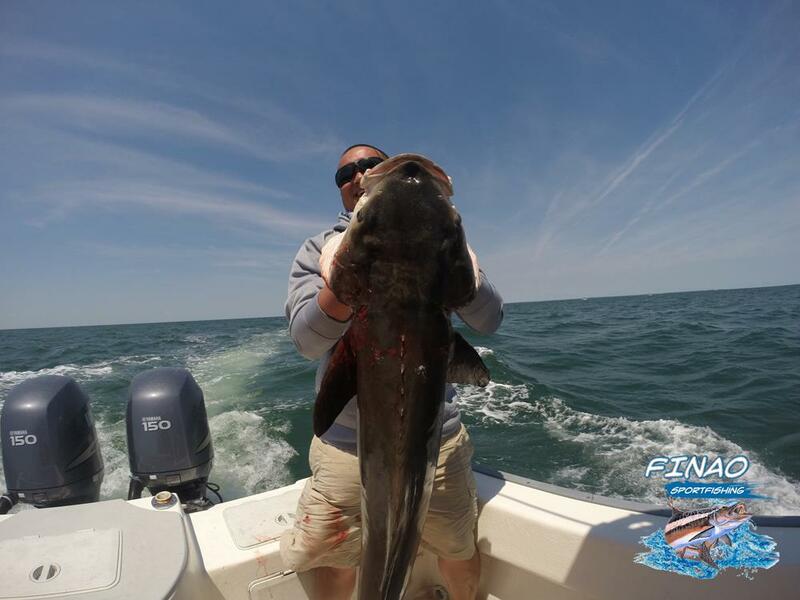 Cobia are one of the largest fish the Chesapeake Bay has. The average size Cobia on our Cobia charter is about 30-40 pounds. Cobia can grow to over 100 pounds! There are a few different techniques that we use on our Cobia charter. Sight Fishing and Chumming are our most common ways we fish for Cobia. Sight fishing is a great technique that we use. Sight Fishing allows us to cover miles of water searching for Cobia. When Sight Fishing we also see many other species of fish on the surface like Red Drum, Loggerhead Turtles, Cownose Rays, and Sharks. Chumming is another productive way to catch fish on our Cobia charter. Chumming is a old school style of fishing. When chumming location is everything. Shoals, Channel edges, and structure make for the correct location to chum. This technique is best in the early morning or when the weather is not good for Sight Fishing. The next time you are looking for an exciting fishing trip in Virginia book with Finao Sportfishing. We know the best techniques for every situation. No matter the weather or the time of year we will do our best to put you on the fish of a life time!